Reynolds had the gift of uniting extraordinary technical skill with the faculty of pleasing the ordinary picture lover. He could copy the old masters so effectively that even to-day there is doubt in some cases whether certain pictures are his work or are from the brushes of the artists to whom they are ascribed. Even more astonishing, perhaps, was his dexterity, for though he worked with extraordinary quickness, his paintings do not betray (to the uninitiated, at any rate) any sign of haste. He was a great portrait painter, and was perhaps even greater as a painter of children, though he has been reproached with a tendency to portray little Italian angels rather than English children of real flesh and blood. That criticism certainly does not apply to this charming picture - charming both in its delightful colouring and in its tender sentiment. It is a great tribute to his genius, for it shows that while he could rival the Italians in their work, he could still reveal in such inimitable fashion a scene with characters which are essentially English. The picture, indeed, is a reply to his critics. The mother and the child live for us and stir the deep emotions which only genius can reach. 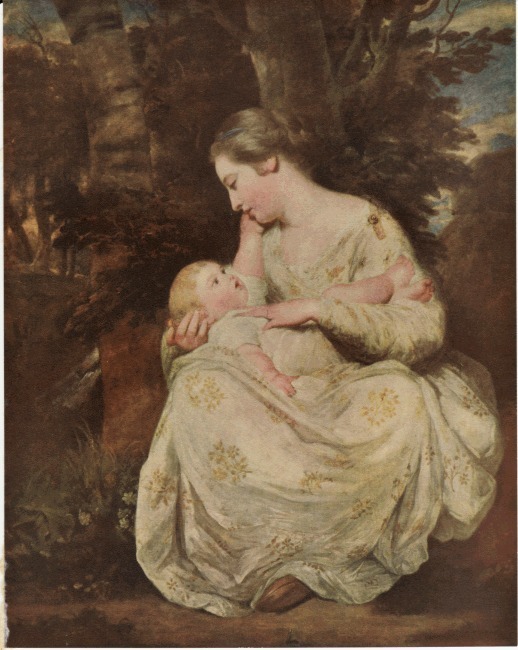 Great portrait painter as he was, Reynolds has here given us a painting that is no mere portrait to please a distinguished patron, but is a study in maternal love and pride, tenderly conceived and delightfully rendered. Reynolds stood alone as the painter of the great men of his time, and the revealer of their characters and capacities. In this picture he showed that he also possessed the gift of seeing into the heart of a mother, and appreciating the self-sacrificing devotion which she displays towards her offspring.